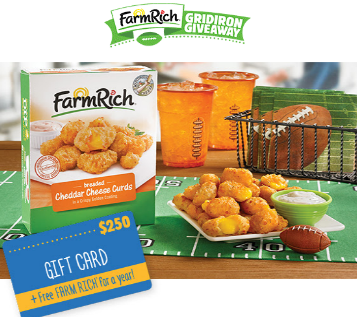 Farm Rich Gridiron Giveaway Quikly Sweepstakes – Win a $250 Walmart gift card & more! Win a $250 Walmart gift card& more! ENTER SWEEPSTAKES HERE – Farm Rich Quikly Sweepstakes page. ELIGIBILITY – You must be a legal resident of the United States, age 18+ years of age, to be eligible to win. SWEEPSTAKES ENTRY PERIOD – Sweepstakes begins at 12:00 a.m. (E.D.T.) on January 16th, 2017 and ends when the Quikly goes live.